This is Johnny Shaw's second novel, following his excellent debut, Dove Season. Again Shaw demonstrates his gift for weaving pathos with drop-dead humor and his ability to create memorable characters who are very sympathetic even though most of them are total losers. 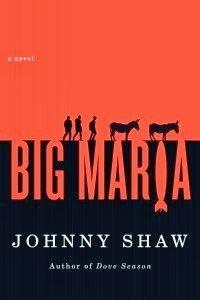 Big Maria basically amounts to Treasure of Sierra Madre meets a Chevy Chase vacation movie. Harry Schmittberger is on medical leave from his job as a guard at the Chuckawalla Valley State Prison. He is living on his disability checks and prolonging his return to work as long as humanly possible--preferably forever. Rickey McBride is barely cobbling together an existence, attempting to provide a living for his wife and infant daughter by driving a dilapidated bus, transporting southern California senior citizens across the Mexican border where they can score cheap prescription drugs. Frank Pacheo is an aging Indian, struggling to beat cancer and other medical problems or at least hold them at bay for as long as possible. When Harry accidentally overhears a conversation about a long-lost gold mine, the Big Maria, he sees what he believes might be his last real chance to escape his miserable life. Rickey and Frank are drawn into the plan which seems ridiculously simple, save for a few minor problems. To begin with, the map to the lost mine is buried under an abandoned house and the house in turn is at the bottom of a lake that has been created by the construction of a dam. If that weren't bad enough, the mine itself is now smack in the middle of a military artillery range. While obstacles like this might deter lesser men, Harry, Rickey and Frank press on against all odds, determined to find the fortune that will set their lives on a brighter path. It's an incredible journey, often touching and hilariously funny within the same paragraph. And it speaks volumes to the dreams and to the bonds that drive and inspire all of us.